The best tourism start-up of 2015, Beach-Inspector tests beaches worldwide and simplifies the search for the perfect beach vacation through its detailed rating portal. The winner of an award for the best German tourism start-up of 2015, Beach-Inspector records and digitizes beaches worldwide and shows travelers what they actually look like. In August 2016 alone, Beach-Inspector counted 400,000 website visits. Together with the crowd, Beach-Inspector wants to build up the world's leading brand for beach information. We are pleased to provide you with our pitch deck, which summarizes Beach-Inspector´s business model and strategy and illustrates our company’s potential. As always, you can find all information on us, our team, and Beach-Inspector in our company profile. Please click on the picture above to open the pitch deck of Beach-Inspector. According to a study by ADAC, 52 % of vacations booked in Germany are beach vacations. In other countries around the globe, the share of beach vacations is similarly high. Each year, approx. 700 million people go on a beach vacation. In other words, beach vacations are the largest segment of the tourism sector, and beaches are the main reason for people to go on vacation at all. Nonetheless, there is hardly any relevant and structured information for this place where beach vacationers spend most of their vacation. Thanks to Beach-Inspector, beach vacationers no longer need to rely on the scarce and hardly objective beach information they get from tour operators and websites, nor do they have to hope that they will not be disappointed when arriving at the beach. Beach-Inspector records and digitizes beaches worldwide and provides travelers with an authentic and detailed picture of the beach. Specially trained Beach-Inspectors test beaches on site based on a standardized procedure. Indeed, they rate the beach based on its suitability for certain target groups, document their experience through pictures and videos, and make clear recommendations as to the beaches' suitability for different people. 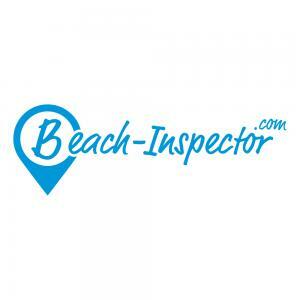 Beach-Inspector has already rated over 1,000 beaches in more than 20 destinations. These ratings are available in both German and English. Important vacation regions, such as the Canary Islands, the Balearic Islands, parts of the Spanish mainland, and the Algarve, are already available for Beach-Inspector users on the website. Of course, dream destinations like Mauritius and Bali are not missing from Beach-Inspector.com either. The number of visits to our website (i.e., of active sessions) constantly increases by over 30 % per month. Numerous popular tour operators (e.g., Thomas Cook, FTI, and alltours) and touristic regions like Israel and Dubai have already become part of our client base. In addition, some renowned investors and tourism experts, for instance MairDumont Ventures (known for the Marco Polo travel guidebooks), have recognized Beach-Inspector's enormous potential and have invested in our company. Our experienced team of three founders is focusing on the goal of developing one of the world's largest tourism websites and a brand for beach information. With the Companists' help, we plan to make Beach-Inspector profitable. Beach-Inspector provides the world's most detailed and highest quality beach information in a neat and simple fashion – both on our website and in our individual destination apps (for iOS and Android). We have developed a standardized on-site procedure for having beaches worldwide rated in a consistent and objective fashion by our Beach-Inspectors. In 2015 alone, we received more than 10,000 applications from people willing to test beaches on our behalf. All suitable applicants receive online training consisting of our methodology, our requirements, and our quality standards. Once they have passed the final exam, successful applicants have to prove their skills through a sample beach check. When the material we receive meets our quality standards, we commission the Beach-Inspectors to rate beaches within a limited region. Afterward, we pay the Beach-Inspectors based on the number of beaches and the quality of their work. For each beach, we record more than 120 data points that influence, among other things, our calculation of beach categories, that is, a beach's suitability for families, relaxation, parties, and water sports. Indeed, we do not just decide about the family factor (i.e., the suitability of a beach for families with children) ourselves, but calculate this factor based on numerous criteria, for instance a suitable infrastructure, easy access, the waves/current, the child-friendliness of beach visitors, safety at the beach, etc. As our data are structured, users can filter them based on specific criteria that are important to them when choosing a beach. We then show them a selection of beaches fulfilling their requirements. What is the occupancy rate of the beach throughout the season? People from which countries go to the beach? How suitable for flirting is the beach? Which water sports are possible at the beach? How child-friendly are the people at the beach? Our Beach-Inspectors also record their beach experience in the form of pictures and videos and make clear recommendations as to the people for whom the beach is suitable. Choosing the region: Beach-Inspector provides inspiration to users with regard to possible destinations. Choosing the vacation spot: Beach-Inspector helps users orient within a destination. Confirming the decision to book: Is the hotel beach really suitable for me? Discovering new things: Users will never miss a beach highlight thanks to Beach-Inspector. After their vacation, users can share their experience and rate the beach they visited on Beach-Inspector. Beach-Inspector records and digitizes beaches worldwide and provides clear recommendations as to a beach's suitability for specific target groups. The Beach-Inspector service is meant for consumers, that is, for the usual beach vacationers (B2C clients). These people can use Beach-Inspector for free. We generate revenues by integrating touristic service providers (B2B clients). To all of the above businesses, Beach-Inspector provides a novel and highly efficient way of acquiring clients. The Beach-Inspector business model is based on several revenue streams. Beach-Inspector is marketing the majority of destinations covered exclusively to single tour operators. Tour operators provide us with travel offers that we match with a specific region's beaches. In doing so, we display the best hotel or travel offers in the vicinity of the beach. Once users have found a suitable beach on Beach-Inspector, they can immediately look at travel offers related to that beach. If users then click on one of the offers, our website redirects them to the tour operator. Beach-Inspector generates revenue through each of these clicks. Beach-Inspector enables B2B clients to present themselves to a clearly defined target group through display and performance campaigns (banner ads and text/image ads) and pre-roll ads (brief commercials before the start of an introductory beach video). Through each ad displayed, Beach-Inspector generates revenue. At the moment, Beach-Inspector is generating EUR 75 for each 1,000 website visits (active sessions) through the above revenue streams. We will increase this value to EUR 140 per 1,000 visits within the next two years by marketing our website in an even more professional way and by integrating additional categories of service providers. Touristic regions are highly interested in presenting themselves and their beaches on Beach-Inspector to attract new beach vacationers. Tourism organizations not just pay us for adding their beaches; they also book additional marketing packages on Beach-Inspector. Current clients that have commissioned us to check their beaches include Israel, Dubai, and the Bay of Lübeck. New beaches lead to more choices for our users. Commissioned checks lead to positive contribution margins. Beach-Inspector checks beaches on site with the help of specially trained Beach-Inspectors. Beach-Inspector is the only service provider that possesses large quantities of structured data for each beach. This fact enables users to search for specific characteristics and to filter the data in order to find those beaches that best meet their requirements. We have protected the Beach-Inspector brand in the best way possible by registering it as a European wordmark. The Beach-Inspector business model is based on an increase in reach (i.e., in the number of website visits). Over the past six months, we have increased the number of website visits more than fivefold. This increase corresponds to monthly growth of over 30 %. Google displays Beach-Inspector for more than 12,000 search terms. The higher a website appears in the list of Google results for a search request (visibility), the higher its (organic) reach is. As the information on the Beach-Inspector website is globally unique, has a high quality, and is very extensive, Beach-Inspector is already highly relevant to search requests for beach-related terms on Google. Ever since early 2016, our own SEO/editorial team has been focusing on the subject of search engine optimization. During this period, we have increased our visibility significantly, thus also increasing the number of users attracted through unpaid Google search more than tenfold. The subject of "beach" has an extremely positive connotation, is highly emotional, and is suitable for a mass audience. As Beach-Inspector is globally unique and as the media like to refer to experts on specific topics, the conditions for positioning Beach-Inspector within the media landscape over the long term are ideal. In fact, within only a year, Beach-Inspector appeared on German TV stations ARD (Der große Reisecheck Mallorca), RTL, Kabel1 (Abenteuer Leben), n-tv, and Sat.1 and was featured in numerous articles in major German print and online media (e.g., Spiegel Online, Die Welt, and FAZ). All this helps us increase awareness of our brand, thus also helping to embed the Beach-Inspector brand in our users' minds. Paying for specific users that are redirected from Google and other online media on a cost-per-click basis (i.e., a fee for each website visit of a user) is a very effective way of attracting users to Beach-Inspector. As Beach-Inspector provides extensive content and as there are hardly any other beach information websites, paid online marketing campaigns can be very effective, yet relatively inexpensive because there is little competition. With a cost of EUR 0.04 per website visit through all channels (i.e., through performance marketing and unpaid channels), Beach-Inspector's cost of client acquisition is significantly below that of other businesses in the tourism industry. Beach-Inspector's clients include major tour operators. From these B2B clients, Beach-Inspector receives a commission for each visitor that it refers. This commission is significantly above the market average, for over 95 % of users of a specific beach page click on travel offers and are thus pre-classified for tour operators in the best way possible. Indeed, there are already waiting lists for tour operators interested in several of our new destinations. Many vacation regions (e.g., Dubai, Israel, and different regions by the Baltic Sea and the North Sea) have recently commissioned Beach-Inspector to rate their beaches and have paid the entire rating costs, including a marketing budget, to have their beaches rated in a professional manner. By ensuring that their beaches appear on Beach-Inspector, such regions get permanent access to potential beach vacationers and to a targeted marketing channel. There are currently approx. 1,000 beaches on Beach-Inspector.com. This information is available in both German and English. Thus far, Beach-Inspector has been actively communicating only in Germany. Our reach is 400,000 visitors per month. For each 1,000 visits, Beach-Inspector currently generates EUR 75.00 in revenue; in addition, we generate revenues through destination checks and sponsoring. Creating an active community that expands our content by adding comments, ratings, images, and videos. We intend all these measures to directly increase our reach, thus leading to higher revenues. Until early 2018, we plan to increase the monthly reach of Beach-Inspector from currently 400,000 to 750,000 visits and to increase the revenue per 1,000 visits from EUR 75 to EUR 105. If we achieve this goal, Beach-Inspector will reach break-even point and become completely independent of additional financing rounds. As there are approx. 700 beach tourists each year, beach vacations are the largest touristic segment. As many as 98 % of people use the Internet while planning their vacation. To 74 %, the Internet is the main source of information while doing so. According to a study by TripAdvisor, travel information and rating portals not just serve as the first stop for people looking for inspiration while planning their vacation; they also play an important role in the decision to book a vacation. Beach-Inspector addresses all beach vacationers, no matter whether they look for packages or individual trips; are families, singles, or couples; or are young or old. In short, we cover all target groups. Our website's sociodemographic user data reflect this. Indeed, the average Beach-Inspector user is 44 years old (i.e., part of an age group with considerable purchasing power). We plan to invest the funds we raise in increasing the reach of Beach-Inspector. More specifically, we want to invest these funds in new beach ratings, in the internationalization of our platform, and in the staff necessary for these purposes. Ratings for another 1,000 beaches (i.e., a total of 2,000) Preparations for our market entry in the U.S. (i.e., ratings for beaches in Florida, California, Hawaii, and Mexico). From day one, our management team has focused on attracting investors able to support Beach-Inspector not just through capital, but also through their expertise and networks. As a result, two venture-capital companies specializing in tourism and experienced angel investors have already invested in Beach-Inspector. MairDumont Ventures (MDV) is the investment company of MairDumont, the largest European travel publishing group that owns popular brands such as Marco Polo. MDV supports us in marketing our website among other things. HR Ventures is the investment company of Hahn Air, one of the largest providers of distribution services for international airlines. The company focuses on investments in technology companies from the travel and mobility sectors. We are benefiting from HR's international network and from communication with other companies in the HR Ventures portfolio. Axel was the head of marketing at HolidayCheck for many years (2005-2012). He is familiar with many aspects of our business because of his previous positions, and he is an extremely important partner for us in terms of strategy and product development. Thorsten is the CEO of Sunnycars, one of Europe's largest car rental brokers, and the CEO of autobroker.com. He has more than 28 years of industry experience and a huge network that includes people at the C-level of various companies. Therefore, Thorsten is our networking machine for the tourism industry. Ingo is the chief investment officer at Swiss company-building and venture-capital company Mountain Partners, our co-founder, and an active angel investor. His previous investments included Lieferando, reBuy reCommerce, Holidu, and Regiohelden. Finally, Ingo has a large network within the VC industry. Volker founded Webstock AG (sold to Baader Bank in 1998) and TradeCross AG (sold to VEM Aktienbank in 2005) and co-founded EQS Group (IPO in 2006). An active angel investor, he is familiar with both sides: that of the founders and that of the investors. Consequently, conversations with him are always valuable. Christian founded SUMO, one of the most successful German SEO agencies, and sold it to United Digital Group in 2011. Christian advises us on search engine optimization and supports us through his network within the online-marketing industry. Thomas is the founder of Confero, a specialized financial services company. He is not only a former animateur who knows many beaches, but also a company founder and angel investor with shares in over 10 companies (just like Volker Rofalski). Thomas is constantly involved in our day-to-day business and helps us wherever he can. Michael is an expert on digitization and advises various media companies. Sending specially trained Beach-Inspectors to beaches to have those beaches rated is only the first step. Indeed, we want the content on Beach-Inspector to serve as a basis to users and to motivate them to share their own experience. Creating such an active Beach-Inspector community will be one of our main tasks in the coming months. The crowd, our active supporters and multipliers, will provide us with a major advantage, for a larger crowd is simply more powerful. User ratings of our beaches are extremely valuable to us. We have only just introduced this feature, so we are pleased about any Companists adding a personal rating to our beach information. In the future, there will be many more community features. Upload your pictures and videos, add your own favorite beaches, and help us further develop the Beach-Inspector community with your friends and family. Creating a globally unique online portal is challenging. Consequently, we are thankful for all your tips and suggestions. As a Companist of Beach-Inspector, you can help us very much by simply recommending us whenever you are talking about the beach. Please tell your friends and acquaintances about Beach-Inspector. Of course, we are also thankful if you share our posts on Facebook etc.